Every now and then, we hear stories about violent crimes coming from places that you wouldn't normally think that crime would take place in. 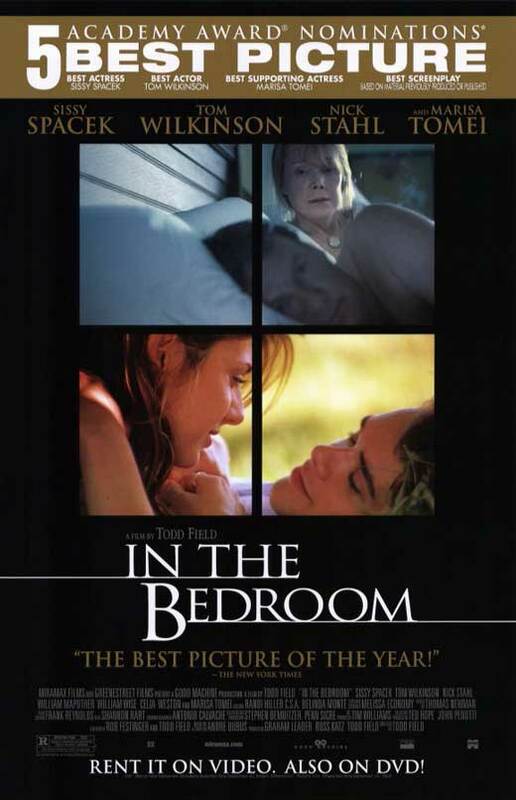 In The Bedroom is quite demonstrative of that as it not only shows that violence can come from unexpected places, but unexpected people. Frank Fowler (Nick Stahl) has just come home from college and is dating a single mom named Natalie Strout (Marisa Tomei). Frank's parents, Matt and Ruth (Tom Wilkinson and Sissy Spacek), have their reservations but are warm to Natalie. That is until Natalie's ex-husband comes back into the picture, causing a tragedy to take place and things slowly take a turn for the worse. I'll start off with the acting, which is brilliant. Sissy Spacek is a quiet masterclass as Ruth Fowler, the mother who is loving yet skeptical. But when the tragedy takes place, she slowly becomes cut off and develops a boiling rage that shows through her cold silence. Tom Wilkinson is equally as astounding as Matt, who is the more lenient father that, unlike Ruth, tries to put on a brave face after the aforementioned tragedy yet has a bit of a quiet rage locked inside. Since grief is channeled in different ways, both Spacek and Wilkinson showcase the different forms of grief perfectly. The film is very much about grief and that theme is handled very realistically. Next, I'll get into the acting of Marisa Tomei. It was very complex, in my opinion. Tomei brilliantly plays a woman who slowly realizes that she has made a mess of things yet by the way she shrugs her shoulders, still feels like she is caught in the middle. She doesn't even have to say anything to showcase that. It is all expressed in her eyes. Spacek, Tomei, and Wilkinson were all just splendid and I thought they all rightfully deserved their Oscar nominations. Nick Stahl was also very good as he was very endearing as the lovestruck son. I also thought the film was rather haunting in a way. It had a bit of chill to it because of how, not just because the theme of grief is showcased, but because it is one of those films that shows how, kind of like Last House on the Left, the most heinous or horrific crimes can come from the most simple towns or even people. Except this film is definitely not as violent as Last House on the Left. The direction by director/writer Todd Field was also quite brilliant. He has a background in acting and to me, it really shows as he flawlessly was able to get masterclass performances out of his actors. I especially liked how he directed some of the more intense scenes, like when Ruth and Matt finally come to terms with their grief and start to fire at each other. I feel that Field creates a feeling of the actors being enclosed, which fits the "bedroom" of the title. The "bedroom" is said to refer to a lobster trap that can hold up to two before they start to turn on each other. Overall, In The Bedroom is a rather haunting demonstration of grief and small-town America that features outstanding performances from its cast and visceral direction. I wouldn't say that I would recommend this to everyone because it is a bit talky and not everyone likes films like those. But if you want to watch a film with flawless acting and powerful, artistic storytelling, then put this on your watch list.